Are you a Fen-sucked Dull-Eyed Canker-blossom? Do you know how many sonnets the Bard wrote, or which phrases we use that he coined? Have you any idea what an oxlip looks like? 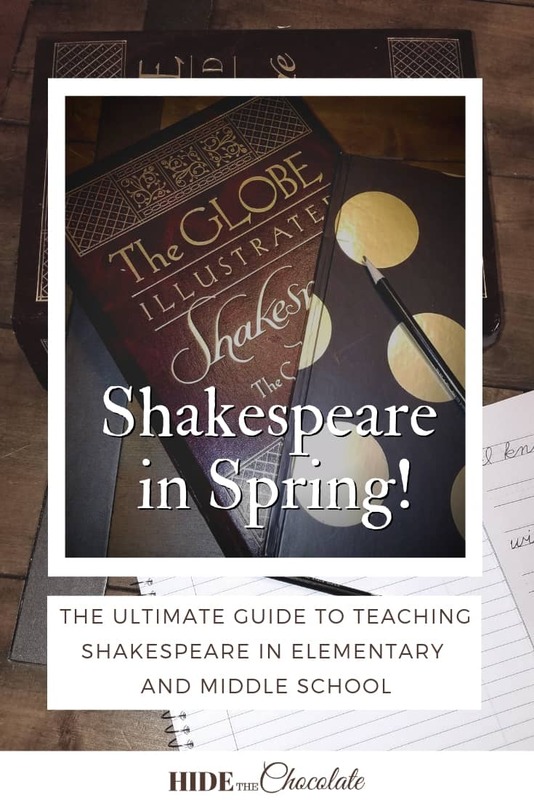 If you’re curious about answering any of these questions, then this Ultimate Guide to Teaching Shakespeare might be for you! Each Spring our homeschool is transformed into a tragic, comedic, insult-driven world of the art of the brilliant 17th-century playwright. It’s Shakespeare in Spring! When I first started teaching Shakespeare to my girls in elementary school, I was a bit nervous about what they would understand and how much translating I would have to do. I was concerned that they were too young and that truly appreciating Shakespeare wouldn’t be possible until they were much older. But, I loved reading and performing the plays of Shakespeare in high school and I was eager to get them started on this rich literature and its eloquent language. They still surprise me. They not only enjoy the comedies, but they are intrigued by the mystery of the tragedies. I have caught my children sneaking to read Shakespeare when they are supposed to be working on something else. They are constantly asking when they can watch the current play we are studying because Shakespeare is meant to be performed and can be enjoyed so much more this way. 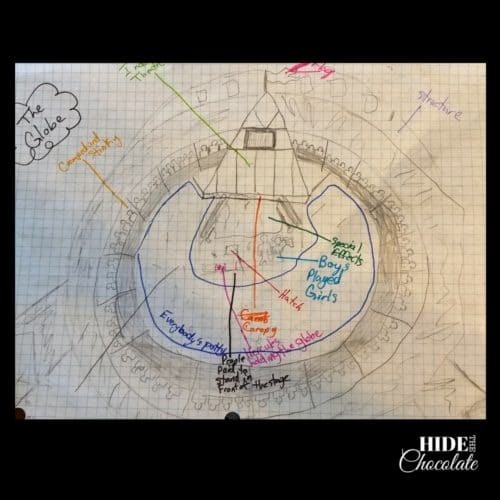 How Do I Teach Shakespeare to Elementary and Middle School Students? Each Spring we start by picking 4 to 6 plays or sonnets to study. This can change depending on our interest level. We try to pick plays from different genres. Sometimes, we pick plays just because we love them and we want to study them each year. The language of Shakespeare can be difficult for small children. We start our study by reading the play from a children’s book of Shakespeare stories. Our favorite, by far, is Favorite Tales From Shakespeare . 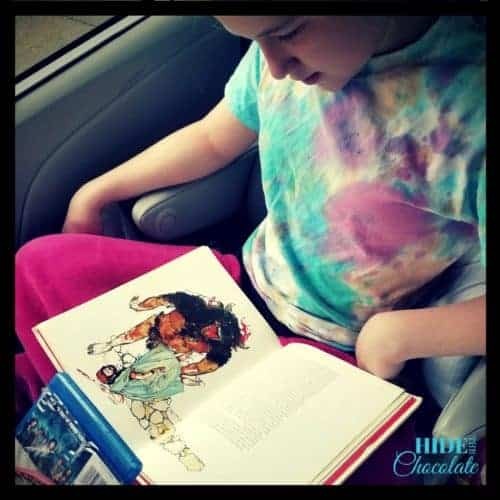 This book has fantastic illustrations and tells the stories with such humor and creativity that kids and adults will both love it. My girls love the stories in this book and beg me to read from it often. Unfortunately, it is out of print, so the only way to obtain it is used. However, if you can find it, grab it. This book will strike an interest for Shakespeare in young minds. Another fun way to read Shakespeare is through graphic novels. Graphic Shakespeare includes five of Shakespeare’s plays written in comic strip fashion. My girls like the fun of reading these graphic novels. The books are written in Shakespeare’s language but include translations as footnotes. This was of particular help to my children who sometimes struggle with the language. 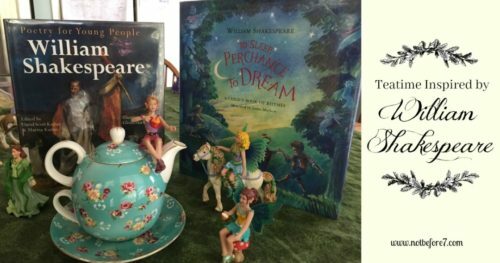 If your kids are into texting, my friend Mary at NotBefore7 recommends the OMG Shakespeare series. These books translate the plays into text messages. They’re actually quite funny, but parents beware, some have language that is inappropriate for young readers. Throughout Shakespeare in Spring intersperse some history and facts about the author. One of our favorite series is the Who Was? series of books. These historical biographies are great and we use them frequently in our homeschool. We learned quite a bit about the famous author from Who Was William Shakespeare . Another book we’ve enjoyed is Usborne’s World of Shakespeare Reference Book . This book is great spread over several days. It is full of information on the plays, sonnets, life and times of Shakespeare. Or if you would rather watch your history in video form, the Biography channel has a mini-biography. If you have plans of watching a play, then you need to hear the original language. Just reading the plays would be difficult for young children. We’ve found some great books that help us with this problem. No Fear Shakespeare quotes the original play on the left side of the book and then translates it on the right side. 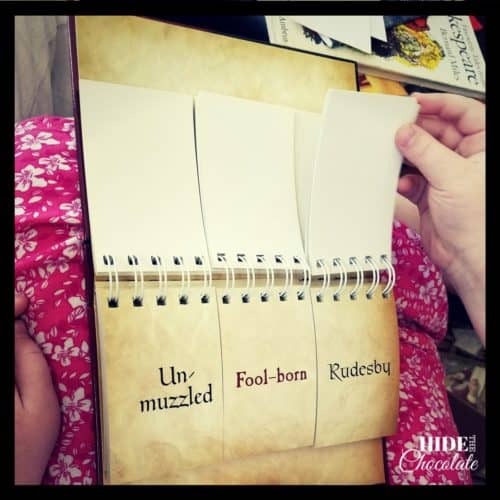 This is fantastic for moms who are struggling with what a “rudesby” is. We even use these books when we’re watching the plays to help us during scenes that can be confusing. If you would prefer an online version, the No Fear series is available on Spark Notes. Another similar series is Shakespeare Made Easy. These books are set up in the same way as the No Fear Shakespeare series. How to Teach Your Children Shakespeare is a great resource to help you teach your children famous quotes of Shakespeare. It guides you through the steps to memorizing short passages from some of Shakespeare’s more popular works. You can also incorporate Shakespeare copywork into your study. Not only will this help with memorization, but with spelling and grammar. 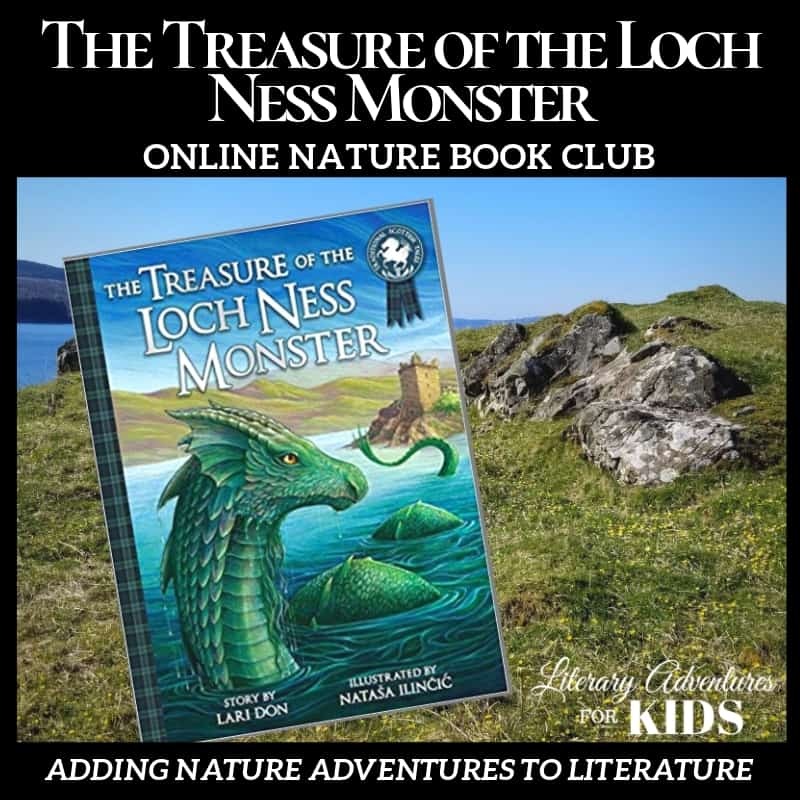 It visually puts the image of these beautifully written words into your child’s memory. 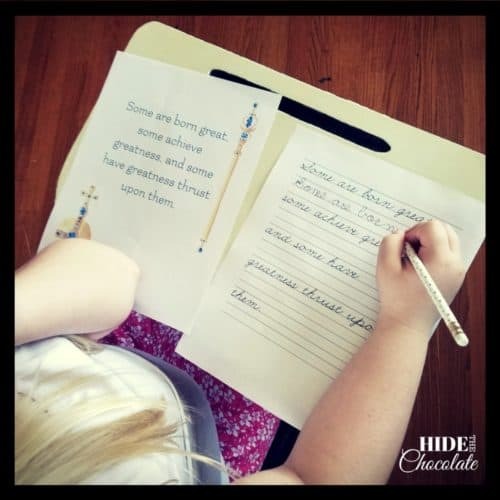 Everyday Graces has Shakespeare copywork in manuscript and cursive that we have used and enjoyed. Having fun is a key element to teaching Shakespeare. Some of our favorite ways to do that are with Shakespeare insults. My girls have a blast using the book, Thou Spleeny Swag-Bellied Miscreant , to come up with insulting names to call their older brother. If you don’t want to purchase the book, there is also an online insult generator. Another fun book is Will’s Words . This book not only gives background for some of the sayings that we use but does so in a very entertaining way. For the youngers who like to color, A Shakespeare Coloring Book is a great book full of illustrations from the plays and the time period. My youngest likes to color while I’m reading the plays out loud. Once you find all those great words that were coined by Shakespeare, use these notebooking pages from The Notebooking Fairy to keep a running list. Step 7: Watch the play! If you have the opportunity to see a Shakespeare play performed live, I highly recommend it. Most recently we saw Romeo & Juliet at the theater. Seeing a play performed as it was intended is truly the best way to understand the spirit of Shakespeare’s works. Jimmie at Jimmie’s Collage gives some great reasons for seeing Shakespeare performed live. You can find performances near you in the Shakespeare Directory. But if a live performance isn’t an option, then I recommend watching it on film. Some of the plays we’ve enjoyed the most are the comedies. My girls’ favorites are Much Ado About Nothing and Twelfth Night. But, what if I don’t feel like I can teach Shakespeare? Well, first of all, you can. 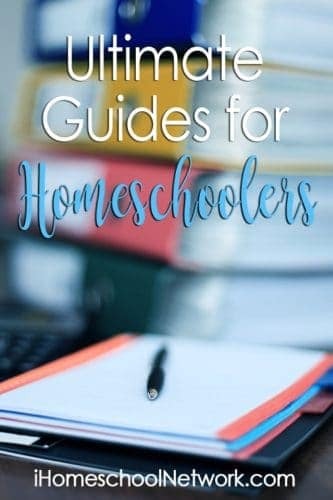 Most of my homeschooling has been spent learning right along with my children. Teaching Shakespeare is no different from any other subject. If I don’t already know the information, then I learn it while I’m teaching it. 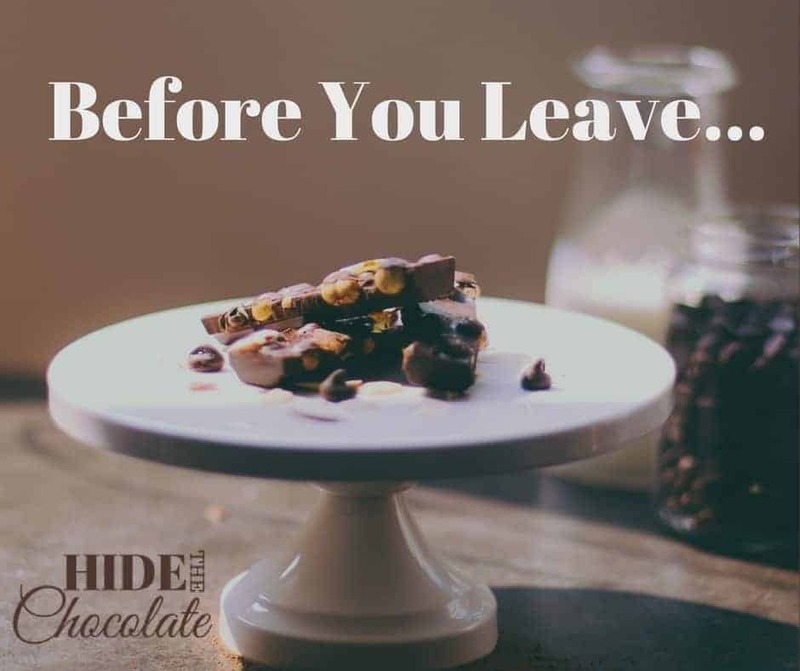 However, sometimes, we need a break from teaching or would just like someone else to take on the planning and teaching. In that case, I would recommend a couple of different courses we have taken over the last few years. 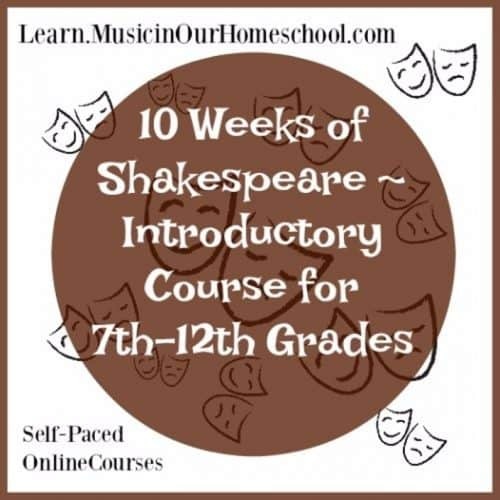 Music in our Homeschool has a 10 Weeks of Shakespeare ~ Introductory Course that is designed for 7th – 12th graders but is easily modified for elementary and middle school. Upper-grade students can work through it independently or you lead your kids through a study of Shakespeare. by performing an act from William Shakespeare’s Star Wars. I like the self-paced aspect of this course because it gives me flexibility. Do we work through everything in the course? No, but if I had a high school student who needed a literature credit I would. 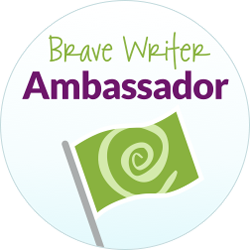 Another fabulous resource is Brave Writer’s Shakespeare Family Workshop. Because it’s a family workshop, all of your children (and even mom and dad) can participate in the class. The teacher was very knowledgeable and the class was easy to follow. It is teacher-led with hands-on activities in a five-week workshop (perfect for Shakespeare in Spring!). My kids especially loved building a replica of The Globe theater. This is a picture of my daughter’s design. 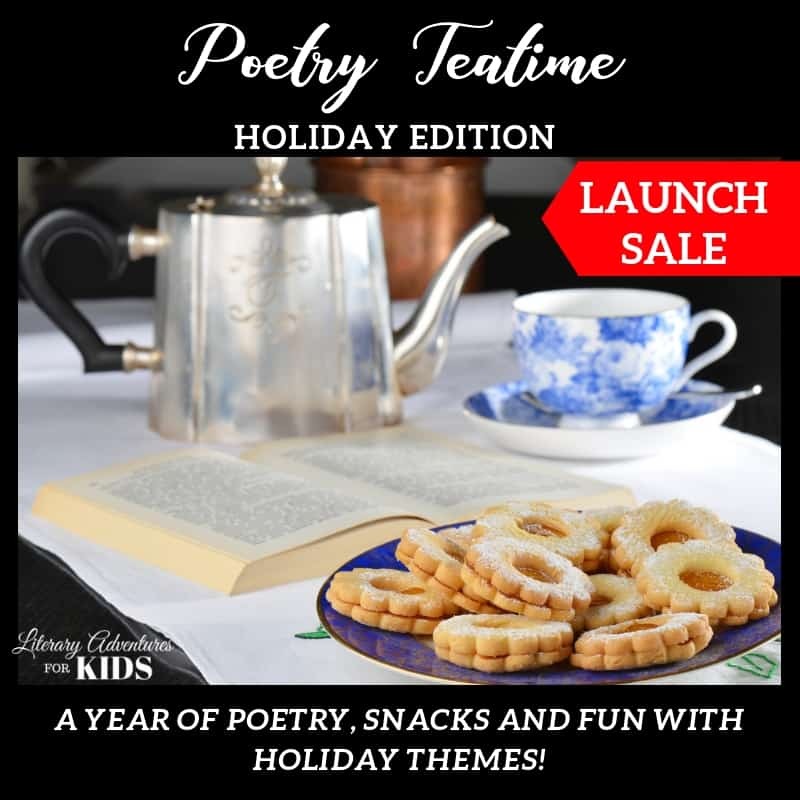 I love Poetry Teatime and I love Shakespeare, so I love this combination by Mary at Notbefore7. This is such a great idea, but only one of Mary’s creative ways to present Shakespeare to her elementary and middle schoolers. 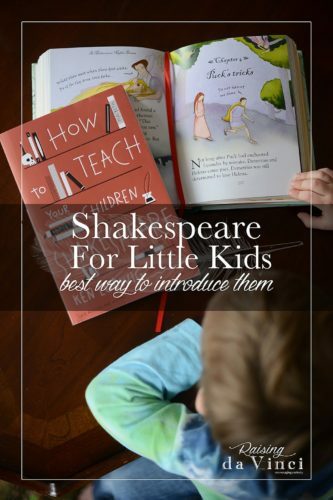 Amanda at Raising da Vinci has a terrific post on the best way to introduce Shakespeare to little kids. Her ideas are great for preschool and early elementary aged children. 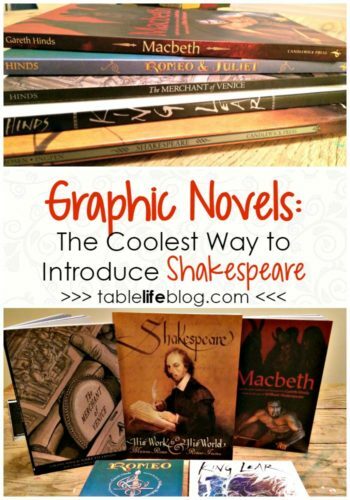 Emily at Table Life Blog reviewed these really cool Shakespeare graphic novels that I’m dying to check out. Grammar…yuck! Seriously, I’m not a fan. But if I can use something I enjoy doing to teach something I despise, then I’m going to try it. 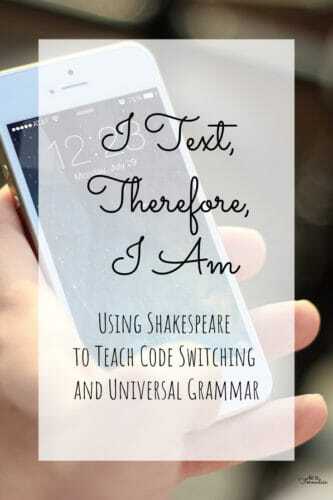 Ginny at Not So Formulaic has a great post on using Shakespeare to teach code-switching and universal grammar. Party School!! 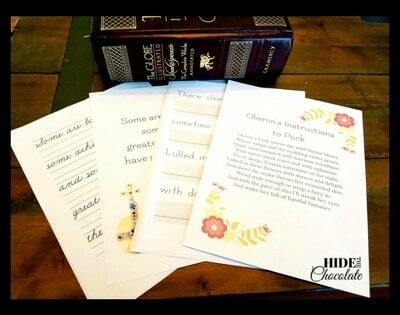 We are the reigning champions of finding ways to incorporate parties into our homeschool. 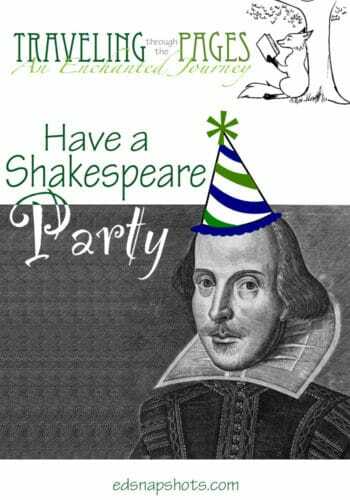 Pam at Homeschool Solutions shows you how to have a Shakespeare party. 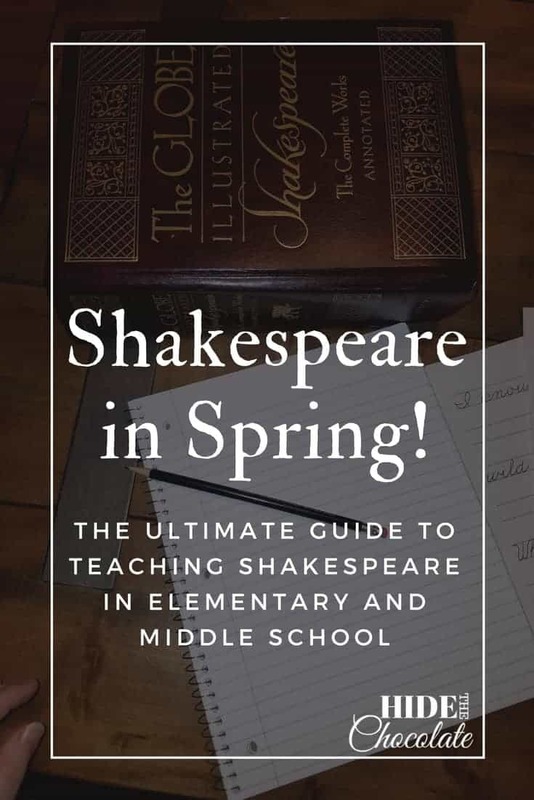 Introducing Shakespeare into your homeschool doesn’t have to be complicated or time-consuming. Adding small steps over time can spark an interest in your elementary and middle school students that will last a lifetime. As an English major in college, I always loved Shakespeare. I have also always read an adaptation first to my kids, or summarized the main plot, or watched the play performed before trying to read it. The plays make a lot more sense that way! Yes! It’s so much easier to follow the language if you understand the plot first. Thanks for all these great Shakespeare resources. I wish our library would get some of these adapted versions! The adapted versions are great for understanding the story in a short, fun way. Great collection of resources! I like the insults one! I hadn’t seen it before. That one is loads of fun! I have definitely fallen short in the homeschool Shakespeare department. You make it look so fun! Thanks for sharing all of these resources at Literacy Musing Mondays. We started with a watered down, abridged version in out 7th & 8th grade and moved to the original stuff in the 9th & 10th grade. Good fun! I never got into Shakespeare growing up, and have felt intimidated by the idea of teaching it to my kids. Thank you so much for this encouraging post. I now have lots of great ideas on where to start! You’re welcome! I felt the same way about teaching it in the beginning. Then I just decided we would learn together. I just got the OMG Shakespeare. Not sure if you actually read it before listing it here, but it is really inappropriate. It has the F word several times, sh*t as well. It’s pretty ridiculous for Shakespeare to have “shut the f$#@ up”. He was great at insults that weren’t bad words at all. No, I haven’t read that one. It was recommended by a friend and we were planning to use it next year. Thank you so much for letting me know. I have updated the post to reflect your experience. excellent list of resources, pinned! i am hoping this summer to get the lad out to play.